Inventory We are a resale marketplace, not a box office or venue. Ticket prices may exceed face value. This site is not owned by The Cynthia Woods Mitchell Pavilion . 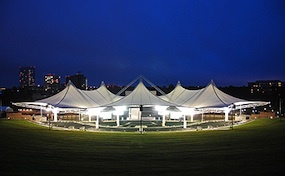 The Cynthia Woods Mitchell Pavilion opened in late April 1990 with successive performances by the Houston Symphony, Frank Sinatra, Alabama, and Clint Black. The Cynthia Woods Mitchell Pavilion is commonly called the Woodlands Pavilion and is located on 2005 Lake Robbins Drive in The Woodlands, Texas. The Woodlands Pavilion box office provides a capacity of over 17,000 (the seating capacity is nearly 6,500). The Cynthia Woods Mitchell Pavilion is the second most used amphitheater in the world to the Wolf Trap in Vienna. Some of the most memorable Woodlands Pavilion tickets include Bette Midler, Elton John, Cher, Rod Stewart, Tina Turner, Van Halen and more. In September of 2008, the venue was severely damaged by hurricane Ike. The facility had to cancel all concerts after the storm, but during the reconstruction an additional 2000 seats were added. The venue was reinforced after the awnings were shredded and the support beams bent in the disaster, so they can now resist 80-90mph winds. WoodlandsPavilion.net is a privately held company that proudly offers online access to the largest selection and lowest prices in the secondary market. We are not affiliated with any official site and or primary box office. To purchase tickets to any Cynthia Woods Mitchell Pavilion events you can order online at anytime or call our operators if you have any questions.